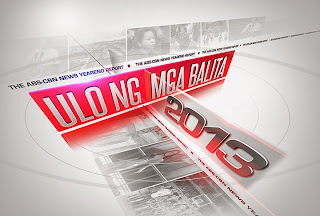 ABS-CBN News presents its yearend report “Ulo ng Mga Balita 2013,” a review of the biggest and most important headline stories of the year that was. Anchored by multi-awarded broadcast journalist Noli De Castro, the rundown will revisit the devastation caused by super typhoon Yolanda and the Bohol quake, the Zamboanga siege, and the Sabah crisis. The report will also trace how the P10-billion pork barrel scam came to light, and will take a second look at the year’s major sports and showbiz news developments. “We will bring you all the news events that made headlines in newspapers, on the radio, television, and even the Internet,” said Kabayan. Joining Kabayan in summing up the biggest news stories of the year are journalists Lynda Jumilla, Jorge Carino, Henry Omaga-Diaz, Atom Araullo, Gigi Grande, Maan Macapagal, Jeff Canoy, RG Cruz, Niko Baua, Rico Lucena, TJ Manotoc and Ginger Conejero.